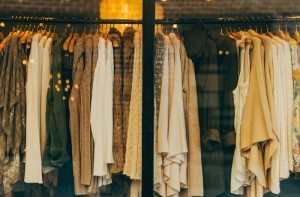 With a charming downtown lined with mostly locally owned stores, Golden offers everything from technical outdoor gear to fine art. Throw in beautiful mountain views, creekside walking paths, friendly shopkeepers and plenty of patios where you can stop for a latte or a craft beer, and Golden is the perfect place to shop. So what can you buy in Golden? Well, just about everything! From the practical necessities at Meyer Hardware to luxurious lotions at Spinster Sisters, Golden has something for everyone. Here’s an overview of what you can find. Outdoor Gear: It’s only fitting that Golden is know for its gear shops. After all, the city is home to amazing fly-fishing, kayaking, rock climbing and more. If you are looking for hiking or climbing gear, Bent Gate Mountaineering is the Metro area’s go-to experts. Arbor Angles is a premiere fly shop and Golden River Sports offers both fly-fishing and kayaking gear and advice. Runners High is home to a community of Golden runners who swear by their gear, as well as their weekly community runs and expert advice. Cyclists love Peak Cycles, Pedal Pushers Cyclery, Big Ring Cycles, Boushie Built Custom Bicycle Studio or Golden Bike Shop. And if you ‘re looking for skis and snowboard gear, check out both Icelantic and Powder 7, two great Golden-based shops known for quality and performance. Men&apos;s & Women’s Clothing: Golden guys and gals are definitely sporty, but like to look fashionable too. Toad&Co Golden and Vital Outdoors offer men and women’s clothing perfect for a Golden look. 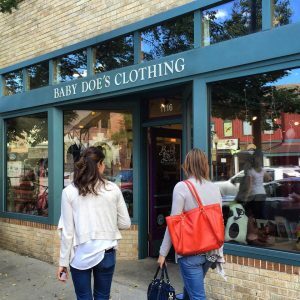 Baby Doe’s has women’s clothes for every occasion, as well as handmade jewelry. Golden is also home to Clothes Mine and Rewind and Truly Bohotique, consignment shops that sell quality brands at a fraction of the cost. Toys & Candy: Kids love Golden too. And a big part of the reason why are the town’s excellent toy and candy shops! Check out Avenue Gifts and Golden Goods for fun games and kids toys. Golden Sweets is the place to stop for old time candy as well as fine chocolates. Antiques, Jewelry, Gifts & Specialty Shops: Nature’s Gift Candleworks is worth a stop for the smell alone. The scent of the hand made candles is divine. Blue Moose Trading Company offers a rustic-industrial aesthetic and eclectic vibe. Avenue Gifts sells a wide range of gifts for all ages, and Golden and Coors souvenirs. You could spend an entire afternoon taking a trip down memory lane at Rockin’ Horse Antiques. At Red Wagon Boutique & Garden Shoppe, you’ll find wonderful gifts for the home and garden, plus adorable pillow pets. Period Six offers artisan cards, art and “ephemera.” And who doesn’t love jewelry? Hometown jewelers Creekside Jewelers offer a wide selection and friendly service. 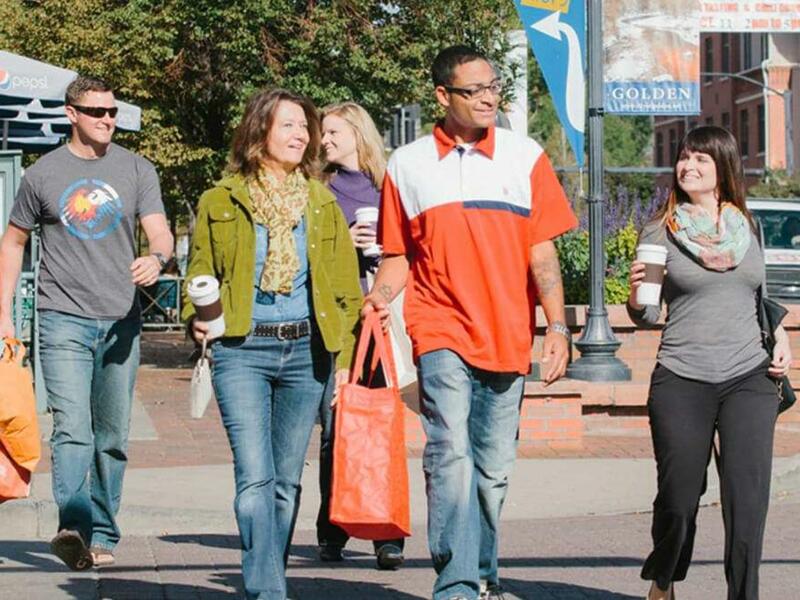 Liven up your shopping experience with fresh air, mountain views and a cool, friendly local vibe at the fall Sidewalk Sale, Saturday, Sept. 9, 2017 from 10 a.m. - 5 p.m. Shop Golden!